Our goal is to provide cost-effective measures to ensure adequate care and return to work in places where it can be tough to find a cup of coffee, much less an MRI. We’re talking about places at war, with inadequate medical facilities, treatment and standards, or with unstable governments. We handle language and cultural differences, and inadequate documentation, too. Chris Catrambone forms Tangiers International. Operations established in Reggio Di Calabria, Italy. A niche conflict zone provider of claims services. Developed to offer bespoke services to experts managing Defense Base Act and Foreign Voluntary Workers Compensation insurance claims outside of the continental USA. Tangiers relocates to Malta: strategic location. Strategic location, infrastructure, an English-speaking workforce and an attractive legal and regulatory framework. Introduces new customised Medical Provider Networks in Iraq and Afghanistan for insurance clients. TI reach: over 110 countries. Tangiers International establishes regional management networks in the Middle East, Asia, Africa and the Americas. Providing better oversight of Tangiers’ field work. Expands cashless medical networks to 40K+. Streamlines claims services and industry-wide recruiting. Establishes Third Party Administrator claims services. Tangiers experiences significant growth and begins to work with Lloyd’s of London syndicates. Tangiers International provides support to the start up of Migrant Offshore Aid Station, a search & rescue NGO providing assistance to people who find themselves in distress on high seas or trapped in unsafe vessels. Tangiers International 24/7 provides a full set of services including Emergency Medical Evacuation, Travel Assistance, and on-the-ground Medical Case Management worldwide. Tangiers International gets appointed for managing Accident & Health, Personal Accident, Travel Medical and Short Term Medical insurance policies worldwide. Tangiers International is awarded ISO 9001:2015 certification. Tangiers International launches medical service solutions in implementing remote clinics and site assessments for corporations. Tangiers International releases its online claims submission process. 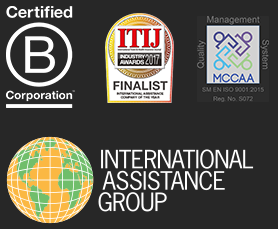 Tangiers International becomes a B Corporation, meeting rigorous social and environmental standards. Tangiers International launches it app for ease of policy details, searching for a provider, submitting a claim and getting up-to-date security alerts.